Playa del Carmen is a lively beachfront city on the Yucatan Peninsula offering a range of diversions from sophisticated to sand-between-the-toes casual. The third largest city in the state of Quintana Roo, Playa del Carmen (or Playa, as it’s colloquially known) has blossomed over the years from a small, scruffy fishing village to a rakish metropolis dedicated to the sybaritic life. The party scene in Playa, while robust, is of a more sophisticated variety than its rowdy northern neighbor Cancun. The nightclubs and bars attract a grown-up good time crowd, many of them European, who love to see and be seen in the town’s famous beach clubs or in nightclubs like notorious party palace Coco Bongo. In keeping with the city’s egalitarian spirit, there’s something for everyone here, whether you’re after a quiet coffee in a leafy café, rustic Mexican food on the fly, or a dance-til-you-drop nightclub crawl. For all Playa’s whirlwind development, the town hasn’t lost the charms that first attracted visitors to this idyllic stretch of coast: beautiful beaches, perfect weather, and a laid-back, welcoming ambiance. Stroll Quinta Avenida (5th Avenue), Playa’s main promenade, which stretches from Calle 1 north to Calle 40. The spotlessly clean paved pedestrian zone is lined with bars, upscale boutiques blaring dance music and stores selling all manner of tourist tack. Stop into the sweet whitewashed church with its glass arched window behind the altar, for extraordinary ocean views and a tranquil reprieve from the hustle and bustle. Take a pit stop in Calle Corazon, a sweet horseshoe shaped street overhung with trees decked with lanterns. The scene is more sophisticated than that on Fifth Avenue, with chic cafes and bars lining the leafy street. Xcaret, Isla Cozumel, and Puerto Morelos are all close day trips away. La Bodeguita del Medio: This lively restaurant on Fifth Avenue offers free salsa dancing lessons on Mondays and Wednesdays at 8 pm. Carlos and Charlie’s: A double-story bar/pub with a laid-back ambiance and an irreverent attitude (a hanging sign out the front reads “Customer always wrong”). Fusion: A stylish restaurant/bar on the beachfront that attracts a young, fun-loving crowd who come for the fire shows every night and to share a romantic table on the beach lit by hurricane lanterns. La Cueva del Chango: Charmingly rustic restaurant with a lush garden terrace and menu featuring seafood and chili-laden dishes. Diabolito Cha Cha Cha: This thatched roof, retro-themed bar has checked floors, vintage light fittings, and 1950s and 60s furniture. 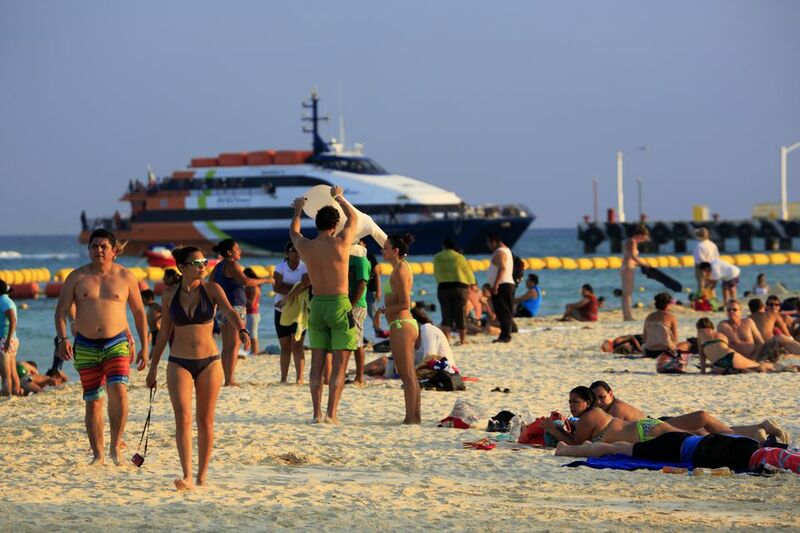 People watching is Playa’s prime leisure activity and can be best-practiced beachside, where the perfect body crowd love to promenade and preen along the wide white sand beach, lined the whole length with lounge chairs, umbrellas, and beach bars. The Blue Parrot: The oldest bar in town – it opened 1984 – this legendary Playa ​beach bar has nightly fire shows, a dance floor on the sand, and swings hanging at the bar. Kool by Playa Ttukan: The town’s other famous beach club inhabits a stretch of sand that’s famous for attracting the beautiful people, both in and out of their bikinis. Mamitas Beach Club channels Ibiza cool with its white-curtained beach cabanas, endless cocktail service, and beach volleyball games. In Fashion: This design hotel, situated at the heart of the nightclub strip, feels a little like a nightclub itself. A dramatically undulating tiled wall leads to the art-filled lobby featuring post-modern furniture and an unending electronic beat. Hotel Lunata: This hacienda-style boutique hotel is a quiet haven just off the main strip. The rooms are named for moons, and a tranquil courtyard with lawns and garden out the back provides a soothing green space. Hotel el Punto: This New York loft-style hotel is sleek and modern, from the limestone exterior to the exposed brick feature walls, abstract paintings, and polished floorboards. The fabulous rooftop bar features reflecting pools and day beds for cocktail hour lounging. Hotel Basico: This famous minimalist-cool budget hotel can be identified by its industrial-chic exterior and compact rooms with floor-to-ceiling glass windows. Playacar: Just out of the main town is Playacar, an upscale community where the wealthier denizens of Playa live and play. The Royal Hideaway Playacar is an alternative for those wanting to experience the town but retreat to luxurious splendor at the end of the day.